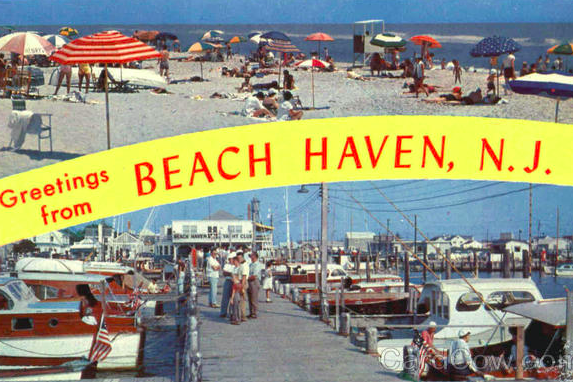 Old postcard from Beach Haven on Long Beach Island. Beach Haven, alternately known today as Queen City, is one of Long Beach Island's top destinations, a resort town established in 1873 to attract wealthy Philadelphia residents for summer outings. While most vestiges of the town's early days were wiped out by fierce storms in the 1940s, including the Great Atlantic Hurricane of 1944, some of its traditional Victorian and Edwardian structures remain intact in the Historic District, recognized by New Jersey and the National Register of Historic Places. A goldmine for entertainment at the shore, Beach Haven is home to the Fantasy Island amusement park and the Thundering Surf water park. Visitors looking for something more low-key can also check out the Long Beach Island Museum or head to the Bay Village Shopping Center, where there's plenty of candy, coffee and kettle fudge to go around. Beach tags are required in Beach Haven at all beaches between Nelson Avenue and 12th Street. Seniors and children under 12, however, can obtain badges free of charge. Preseason badges can be purchased with this order form and picked up at the Centre Street Badge Office during hours of operation between 10 a.m. and 4 p.m. on Friday, Saturday and Monday and 10 a.m. and 3 p.m. on Sunday. In 2016, the preseason badge rate of $30 runs until June 15, after which seasonal badges will go for $40. Weekly badges can be purchased for $20, and daily badges are available for $5. Up until Saturday, June 25, the Beach Haven Beach Patrol will operate with skeleton crews at a rotating list of beaches that can be reviewed here. Lifeguards will be on duty between the hours of 10 a.m. and 5 p.m. seven days a week. Full-time guarding will be in effect until Monday, Sept. 5, 2016. For additional information about guarded beaches, check in with the Centre Street Badge Office at 609-492-9193. No smoking is permitted on any of the beachfronts in Beach Haven. Dogs are not allowed on beaches during the summer months but can be taken along from Sept. 16 through May 14. Throwing around a ball, playing horseshoes and other activities of this nature are only permitted at the discretion of the lifeguard captain, chief of police or their designees. In areas between flags marking authorized swimming areas, these activities are prohibited between 10 a.m. and 5 p.m.
Food and drinks are allowed on beaches, but visitors are urged to clean up after themselves. Alcohol and open containers are prohibited. Parking in the borough of Beach Haven is free. There are three public parking lots on Centre Street, including two located across from each other. Street parking is also available. More information can be found here. In addition to the attractions noted above and mini golf courses scattered throughout Beach Haven, there are also several events on the calendar for 2016. The Hop Sauce Festival on Saturday, June 4, will feature a tasting of gourmet hot sauces, more than 25 craft beers, food from local vendors and live music from five bands. The annual Wine Festival will be held the weekend of June 11-12 at the Taylor Avenue Waterfront Park. Guests will be able to taste wines from a variety of New Jersey vineyards. Live music, food and other festivities are also planned for the weekend. This year, on June 17-18, Beach Haven will celebrate Sharkfest to commemorate the 100th anniversary of multiple shark attacks along Jersey Shore beaches, which later served as an inspiration for "Jaws." The day will be filled with food, beer, wine and entertainment. Activities for kids will include a crabbing contest, volleyball tournament and book signings. On Friday, June 17, a Sharkfest dinner will be held at the famous Buckalew's Restaurant & Tavern, with a guest speaker from OCEARCH, the global nonprofit shark research organization that has been tracking Jersey Shore favorite Mary Lee. This story originally contained information about the Surflight Theatre, which is closed. It has since been edited.